The Hotel Europa Tyrol is centrally located at Sudtiroler Platz 2, across from the main train station. Built in 1869 as the Grand Hotel de LEurope, it has retained its comfortable Tyrolean tradition and atmosphere while incorporating modern conveniences, such as a business center with free internet, and complete fitness facilities. While the public areas embrace a timeless, European elegance, our large, twin-bedded room was distinctly Alpine, light-colored wooden furniture. The nice size bathroom, with double sinks, was well-stocked with all the basics. We decided to have lunch in the hotel restaurant, Europastuberl, before catching the Swarovski Kristallwelten (Crystal Worlds) Shuttle Bus across the way. The comfortable dining rooms are beautifully decorated with attractively-upholstered light wood furniture and lovely table settings. Legend has it that if the light wood, "Zirbe", is cut during the full moon, it will radiate a natural aura of well being forever after. The preparation and presentation of the two seasonal offerings we selected did justice to the fine reputation of the restaurant. My tender medallions of hare were presented in a dog rose sauce studded with wild cherries accompanied by chestnut noodles, chestnuts and savoy cabbage, a marriage made in heaven. Linda was equally delighted with her osso bucco of venison knuckle with homemade cranberry sauce, potato noodles and a crisp side salad. The service was exceptional and the cost was reasonable for the outstanding meal. We felt great. Was it the full moon Zirbe or the skill in the kitchen? The Swarovski Kristallwelten Shuttle leaves Innsbruck main station every two hours from 09:00 to 15:00, returning every two hours from 11:30 to 17:30. The trip takes just under 30 minutes each way. The return fare is 8.50 euro, children under 12 are free. Admission to Swarovski Crystal Worlds is 8.00 euro, children under 12 are free. Both the shuttle transfer and admission are free with a valid Innsbruck Card which entitles you to free transportation on all public transit and numerous other entrance fees and discounts. It's a great buy! Swarovski is a privately owned and operated family business founded by Daniel Swarovski in 1892. Originally located in Bohemia, in what is now the Czech Republic, where there is a long tradition of glass and crystal manufacturing, Daniel Swarovski moved to the Austrian Alps in 1895 to protect his unique inventions from being stolen. Even today, the secrecy of Swarovskis manufacturing method remains a top priority for the company. In 1995 Andre Heller staged the 100th anniversary of the founding of the company as a tribute to the employees and the Swarovski family. The exhibition was so creative and compelling a suggestion was made to turn the concept into an installation of lasting value. Swarovski Crystal Worlds was born. It became such a popular destination for visitors from around the world that it was enlarged in l993. 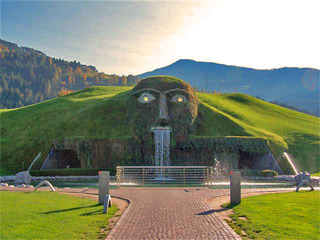 We have collected Swarovski crystal objects for most of our married life so the opportunity to visit Swarovski at its world headquarters in Wattens, intrigued us. We entered this unique world of crystal art treasures and unique thought and sensation-provoking experiences through the head of a water-spouting giant into the dramatic Blue Hall with treasured designs from Andy Warhol, Salvadore Dali and Keith Haring, to name a few. We were enthralled by the world's largest semi-precious stone, the Centenar, 300,000 carats of cut crystal. A wall 42 meters long and 11 meters high filled with 12 tons of glittering crystal was dazzling. Swarovski Crystal Worlds is a series of presentations in thirteen Chambers of Wonder that allows your emotions and feelings to run wild, such as the Planet of Crystal, a 3D installation that blends geometric images and sounds for your contemplation and the Crystal Dome which emulates the inside of a crystal in 590 mirrored facets, a light and sound spectacle. Youngsters were particularly intrigued by a room where the giants personal belongings for his forays around the globe were on display. There was a gigantic accordion playing melodies custom written by Roland Neuwirth, a giant-size ring, gloves and walking stick. In addition, there are rooms with special exhibits dedicated to significant works of art. We were impressed by the Amber Room, Rastrelli's masterpiece which has been missing since WWII, and can be experienced with all senses in a true to scale reproduction by Ingeborg Lüscher. Done in sole soap it's evocative of amber in terms of color, transparency and surface. There is also a café-restaurant, a VIP members lounge for card-carrying collectors and the world's largest Swarovski Shop with eye-popping arrays of crystal in all its glory (no admission ticket is necessary to enter the shop). The grounds surrounding the giant are designed as a playground with space for sculptures. The Hand, a green maze, makes for a nice stroll with the mountains around the site as a perfect serene backdrop. Swarovski Crystal Worlds is yet another great reason to visit Tirol. Since we had a one course lunch today we felt no guilt in having a multi course dinner at the Hotel Schwartzer Adler restaurant. We became a little concerned about our well-being when we found the dining room was done in dark wood! Fear not, the traditional friendly character of the room and staff immediately made us feel really good and right at home. This would be an evening of total relaxation starting with Campari orange for the lady and a soft fruity dry white for me. The evenings offerings were so outstanding that decision-making was much too difficult for our serene mood so we prevailed upon the owner to choose for us. 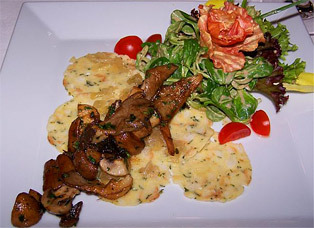 He got us started with small portions of amazing starters, including carpaccio of deer topped with walnut vinaigrette and shavings of local cheese followed by thinly sliced dumplings (servietten knoedeln) with roasted mushrooms dressed with pumpkin seed oil. The appetizer sampling continued with cups of rich, smooth cream of pumpkin soup dotted with tiny slices of smoked deer and pumpkin oil followed by spinach ravioli filled with cheese, cheese dumplings and a bread-bacon dumpling. As main courses, small orders of filets of veal and pork in gorgonzola sauce with noodles and escalope of venison stuffed with mushrooms and ham on juniper sauce with pumpkin spaghetti and spetzle were fabulous. We finished with walnut ice cream, chestnut cream and wild cherries for me and sorbet with fresh berries for Linda. Thank you Harald Ultsch for creating an unforgettable meal for us! After a beautifully-presented, generous breakfast we were off to explore all that is Innsbruck, the capital of Tirol which twice hosted the Olympics, and found its medieval heritage and contemporary shopping gallerias harmoniously blended. Framed by the rugged mountain sides with precipices dotted by trees and snow with glaciated mountain peaks in the distance, Innsbruck is the essence of all that is Tirol. By the way, we found it confusing to find Tirol frequently spelled Tyrol. We were told that the official spelling is Tirol. Tyrol was in fashion some years ago. In Innsbruck, there are three powerful monuments to Tirol's past. The Rudolfsbrunnen, Rudolphs Fountain, on Brixnerstrasse, was built in 1877 to commemorate the 500 years Tirol was part of the Austrian federation and the province's transfer to the Hapsburg King Rudolph in l363. Historic Maria-Theresien-Strasse is the picturesque shopping boulevard that spans the Innenstadt and Altstadt. At the south end of the street is the majestic Triumphforte, Triumphal Arch, which was built in 1765 to commemorate the marriage of Leopold II to Maria Ludovica. Because Leopold's father died during the celebrations, one side of the arch symbolizes joy and the other side, sadness. In the middle of the boulevard is the striking Annasaule, Anna Column, with representations of Virgin Mary, St.Anne, and the Tirolean patron saints. It is not only impressive in its own right but when you see it from afar standing gracefully between the rows of beautiful buildings with a backdrop of forested slopes topped by snow-capped mountains you are catching the essence of Innsbruck. The column was built between 1704 and 1706 to commemorate Tirol's successful resistance to the Bavarian invasion of 1703 during the War of Spanish Succession. 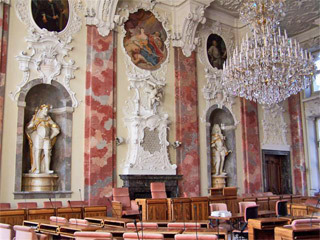 Nearby the baroque Altes Landhaus (built between 1725 and 1728) serves as the seat of the Tirolean Parliament. We began by visiting the tiny, all white, early baroque Landhaus Capela, no longer a functioning church, with its striking gold cross portraying Jesus standing tall. Inside the Altes Landhaus a gracious, wide stone staircase with lovely white sculpture gracing the landings led us to the magnificent Parliament room. Quite correctly the socialists sit to the left, the conservatives to the right and all others in the middle. Sculptures representing typical citizens surround the room while a Swarovski chandelier hangs from the center of the frescoed ceiling. The seats were very comfortable and each had a wood writing arm. There is a special feeling visiting the seat of any government; decisions taken here affect the lives of so many. Leaving the Altes Landhaus we boarded the red tourist bus (4 euro, free with the Innsbruck Pass) to visit Grassmayr, Leopold 53, bell makers since 1599. From church bells to cow bells, Grassmayr bells peal in more than 100 countries on every continent. They have been making bells for over 400 years. It was a unique experience to visit the foundry and learn how the bells are produced. It starts with working with the client to determine exactly what they want which will determine everything from size, shape, and acoustics of the bell or bells and then the design of the system for operating them and finally the installation. There is a sound room where you can have a hands-on acoustical adventure. The bell museum will take you from ore to bell and its historical development. They will be happy to cast a personal Tirolean bell for you with individual ornamentation, at a price, of course. We stopped at Gasthaus Riese Haymon, Haymonstrasse 4 (this was the first road leading to Italy) for excellent coffee. The folks were very friendly and the dining rooms and garden patio were tempting but it was early so we continued up the road to Basilika Wilton, an enormous white and yellow rococo beauty with frescoes from 1755 and gold adorning the ceiling and walls and attractive benches of carved light wood. Graves in the adjoining cemetery were decorated with traditional Autumn arrangements. Returning to Maria-Theresien-Strasse we boarded the bus to Hungerburg from which the Nordkettebahn, (cable car to Seegrube - 1905M and on to Hafelekar - 2334M - free with the Innsbruck Card), would take us high on the Nordkette for panoramic views of the ski slopes and Innsbruck below. After satisfying our mountain air appetites with a tasty, thick, hearty goulash soup, we were in good shape to stroll around and appreciate the beauty surrounding us. Returning, we departed the bus at the Markthalle on the banks of the Inn. It's a well organized market with individual stands offering well-displayed quality products. There is open space where farmers set-up shop early in the day. We were intrigued by the picturesque row of colorful homes lining Innstrasse across the river so Linda took the time to ensure that we could enjoy it again at home. The Altstadt (old town) is a captivating dream featuring marvelous arcades and architectural icons. Helblinghaus, originally a 15th century Gothic town house, was decorated in 1730 with late Baroque stucco. This Rococo beauty is now a residential and business building. The Goldenes Dachl (golden roof) was built by Friedrich IV in 1420 as the residence of Tirolean sovereigns. Emperor Maximillian I added a loggia over an oriel window and covered it with 2738 fire-gilt copper tiles, thus the glorious "golden roof" that has become the symbol of Innsbruck. The work was completed in 1500 with frescoes on the oriel and in the loggia as well as coats of arms and reliefs. The Dom zu St.Jakob (Cathedral of St. James) was converted from Gothic to Baroque between 1717 and 1724 with ceilings and stucco work by the Asam brothers. Lucas Cranach the Elder's famous Modonna and Child graces the main alter. Another fine work is the tomb of Archduke Maximillian III by Caspar Gras (1620). There was a joint Protestant-Catholic service in session and as we were leaving it was pointed out to us that many of those arriving were dignitaries and politicians. This was the beginning of the celebration of Austrian Independence day, commemorating the date when the last allied soldiers left Austria. Many were dressed in their traditional clothing. Four gentlemen were happy to pose for Linda and introduce us to Prof. Inf. Helmut Mader, President des Tiroler Landtages, who was pleased to welcome the visitors from Canada. Time for a coffee and pastry stop and no better place than the local Cafe Sacher. The coffee was very good as was the cheese strudel - and the shlag! The apple strudel did not register in the contest. The Kaiserliche Hofburg, Imperial Palace, was built by Archduke Siegmund the Rich and Emperor Maximillian I in late Gothic style (1460) and converted by Empress Maria Theresia (1754-1773). Rooms of every description are well maintained and decorated with original furnishings and art including an impressive photo of Tirolean soldiers and a display of an armored man and horse. You must visit the Hofkirche, court church. Twenty-eight magnificent larger than life bronze statues surround a monumental tomb dedicated to Emperor Maximillian I (who is actually buried outside of Vienna). The tomb is covered with exquisite marble sculptures depicting scenes in Maximillian's life. The detail and dimension of the sculptures is incredible. A gorgeous black and gold fence surrounds the tomb. At Israelitische Kultusgemeinde Innsbruck, which is at Sillgasse 15, we were met by a very sweet, intelligent woman who took pride in showing us around. 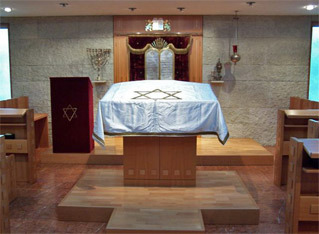 The Synagogue, the spiritual and administrative center of the 90-member community, is important for tourists as well. It was built about 1990 at the same location as the original Synagogue, which was destroyed in 1938. The small chapel, with stone walls and simple in design, can seat about 100. It is open for services only on high holidays, Chanukah and Pesach. Visits can be arranged by calling 43-512-586892. There is a memorial in the shape of a menorah to the four men who were killed on Reichskristallnacht: Richard Graubart, Wilhem Bauer, Josef Adler and Richard Berger, whose names are inscribed on the base. The memorial, on Lanhausplatz, was recently moved to make way for the entrance to a parking garage and it is tucked between two other unrelated monuments. Innsbruck: please show some sensitivity; this monument deserves to be treated with more dignity and suitably relocated! Right off of Maria-Theresien-Strasse opposite the Annasaule monument is the entrance to the modern Rathaus Galleria, a lovely indoor shopping mall, which is connected to the city hall. On the 7th floor, encased in glass with outdoor patio, is the Restaurant Lichtblick. The views are spectacular and when we arrived in the evening the lights glowing in the city and on the mountainsides gave an added dimension to the spectacle. The design is simple, clean and contemporary with a menu to match. Three and four course menus are suggested but any dish can be ordered ala carte at the designated price. The staff is young as is the clientele. 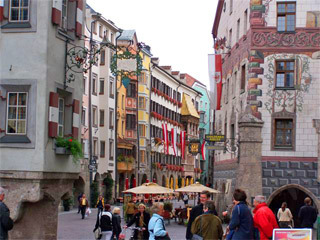 This is the new Innsbruck and it is very popular - make a reservation. Our only wish is that the young would stop smoking; it was a struggle for us in this crowded room. Lindas aperitif was a strawberry prosecco, at the suggestion of our waitress, and I opted for a Wachau Riesling. We were served outrageous house made dense and delicious grain breads and piquant fresh cheese infused with sun dried tomato and paprika. Linda chose a mixed salad to start followed by cold boiled lobster and lemon dab with caramelized seafood sauce, served with a leafy spinach and potato puree. My starter was a brandade of smoked trout with olive oil and artichoke poussin which came, oddly, with a deep fried small chicken leg on mashed potatoes. My main selection was braised and baked milk fed veal with creamy savoy cabbage, potato noodles, chestnuts and red cabbage. Everything was top quality and beautifully prepared and presented. Our waitress was spirited and helpful. Life is good in Innsbruck!